STAMFORD, Conn. – June 7, 2018 – HARMAN International, a wholly-owned subsidiary of Samsung Electronics Co., Ltd. focused on connected technologies for automotive, consumer and enterprise markets, presented the Smart Audio, Cool Cars Award to fifth-grader Mateo Torres at the K – 12 National Invention Convention and Entrepreneurship Expo (NICEE) award ceremony. With a mission to support STEM education in communities around the globe and aid technical skill develop for the next generation of inventors and engineers, HARMAN teamed up with The STEMIE Coalition, a nonprofit initiative focused on elevating K – 12 engineering and design programs to the national level and ensuring all students have access to invention and entrepreneurship education. The STEMIE Coalition launched the National Invention Convention and Entrepreneurship Expo in 2016, as a way to provide students with a voice and platform to share their problem solving and critical thinking skills. During the nationwide competition, young inventors compete for honors on their creative solutions aimed at solving problems through invention and innovation. 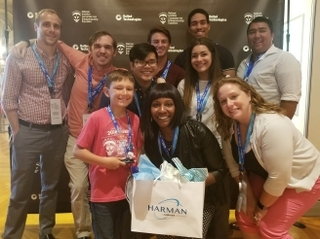 Selected by a panel of HARMAN engineers and leaders, Mateo Torres was chosen from a group of four finalists to receive the Smart Audio, Cool Cars Award for his invention, the Hearing Buddy. Mateo, a fifth grader from Watsonville, California, created the Hearing Buddy after noticing that his close friend was embarrassed to wear his hearing aids to school. The Hearing Buddy is a small figurine shaped like a lizard that camouflages the hearing aid by turning it into a fun accessory. 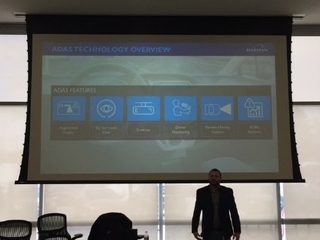 LaNeisha Gunn, who leads HARMAN’s University Relations Program, presented the Smart Audio, Cool Cars Award during a ceremony held at the Henry Ford Museum of American Innovation in Dearborn, Michigan on June 1, 2018. In addition to certificates recognizing their innovative solutions, all four finalists were presented with premium JBL products.